Working FT-8 is usually really easy thanks to WSJT-X. It doesn’t need to much actions from the operator… just double click and wait and all the QSO will be done more or less automatically. This way of automatize the QSO may be sometimes a little bit boring as you don’t have to do many things but it also has some benefits. I was looking for a way to practice some hamradio when I was not at home… I have tested several things but all of them required quite a lot of equipment and complex operations, a computer or whatever. So, my target was to find a way to do something from my smartphone. Remoterig has an android software that you can use, even for voice communications… it is not too bad but it is not the best to call a DX when you are on a public place like a supermarket, in an airport… anyway, digital communications came to my mind. Raspberry Pi with Raspbian and WSJT-X. Once my radio is connected to the Raspberry Pi and it is possible to do QSOs, it is time to do it remotelly. In the Raspberry Pi, install the realvnc-vnc-server package. In my smartphone I installed also the VNC Viewer app. Now I can connect my mobile to the VNC server in the Raspberry Pi. To switch on and off the Raspberry Pi and the radio remotely I am using a RemoteRig WebSwitch and the Android app. It is a very basic app, not very fancy but it does what it is expected to do. I don’t recommend to expose directly the VNC server in your home network to the Internet. So, today I am able to do digital communications with my Smartphone, wherever I am, connecting via VPN to a Raspberry Pi at home. It is great to feel the hamradio is situations that it would not be possible! Hace unas semanas que he decidido empezar una cosa nueva que no he probado aun: EME / Rebote Lunar. Básicamente consiste en apuntar tus antenas a la Luna, transmitir y que tus señales reboten en la Luna para alguien escuche esos rebotes desde la Tierra. Se usa la Luna como pantalla para reflejar esas señales y así conseguir una comunicación entre dos estaciones terrestres. El tema ni siquiera suena sencillo al contarlo así de rápido pero nadie negará que sea un reto! Ahorraré detalles técnicos, la web está lleno de ellos y merece la pena leer mucho antes de lanzarse a la piscina pero… en algún momento hay que lanzarse. No tengo el equipo más apropiado pero sí un par de ideas para ver hasta donde puedo llegar… luego ya iré consiguiendo el equipo según haga falta. Una Yagi de 8 elementos de I0JXX para 144MHz. Una Raspberry Pi con un RTL-SDR básico. Con la idea de minimizar pérdidas he pensado conectar la Raspberry Pi directamente a la antena, con no mas de 10cm de cable. Para ello he montado una Raspberry Pi 3, con Spyserver y una conexión wifi. Eso me permitirá usar el SDR# desde el cuarto de radio, con el WSJT-X y reducir al máximo las pérdidas en el coaxial. Instalar el software es trivial siguiendo este tutorial de Spyserver en Raspberry Pi y en un rato está todo funcionando. Siguiente paso: Conectar la antena y apuntar a la Luna. Habrá que buscar el día propicio. Es muy posible que no consiga escuchar nada, así que habrá que ir preparando un preamplificador… pero eso más adelante, de momento empezaré con este equipo mínimo. I have just released KLog 0.9.2.7. It took a little more than expected but “release critical” last minute bugs prevented the release several times. Here we are again with a new KLog version. As you will see below, there are several things that have been improved in this release however, the main new feature is the one that will check if there is a new version on every start or when the user request. This feature will warn you if there is an updated version of KLog so you can keep your KLog in the last version. Check updates feature added. On start or when user desires KLog checks if there is one updated version available. Simplified the way new logs are added, importing the general StationCallsign & Operators as default for new logs. Improved the way first start was managed when no entity information was loaded. GUI: Application icon is now shown in the application windows. GUI: Updated some messages & tips. GUI: DXCluster offers the Station Callsign as default value to connect. GUI: Some menu minor reorganization. Console: Added a few commands to the console command. Changed the World class to be able to import files from any folder. Changed how some non ARRL valid entities are managed to show the common name (Sicily / Italy). BugFix: When manually importing a new CTY.CSV, although data was updated, it was not shown until next KLog start. BugFix: In the others tab, the DXCC was sometime not correctly identified. BugFix: Update on the DXCC widget caused no data to be shown if some columns were selected. BugFix: Identification is a band was HF or VHF was not always properly done. BugFix: Some improvements in data quality when exporting an ADIF file. BugFix: When importing an ADIF file, if the file was not correct it was not possible to cancel the whole importing process. Some minor changes on source code to optimize and improve. Translations updated: Croatian (TNX M0NKC), Japanese (TNX JL3OXR) & Spanish (EA4TV). If you find any bug or have any suggestion, please let me know. Join the KLog mailing lists and discuss about KLog use and development! Yesterday, after checking some new QSL cards I had received I found a bug that causes the exported ADIF file not to show the right band and mode. I quickly posted a Tweet about the bug so the users were aware… Luckily the bug was easy to fix (in a quick and dirty way, honestly) and here comes the 0.9.2.5 release that brings no new feature but the bug fix. As always, thank you for using KLog and enjoy it! After some days on the RC1, a few bugs corrected I can happily announce the 0.9.2.4 KLog release! GUI: Created a DXCC status where all the DXCC entities are listed showing the working/confirmed status. GUI: Created a Satellite list including (up to now) only LOTW compatible satellites. GUI: Created a widget to manage all “My Data” simplifying implementation of the main widget. GUI: Bands in the combobox are always shown correctly ordered (botton-up). GUI: Improved the LOTW date management (TNX JL3OXR). BugFix: Preferences->Misc: It was not possible to edit the default filename. (TNX K6XT). BugFix: Added the Power unit (W) to the power box. Debian bug #654332. BugFix: When editing a QSO in some text boxes text was reused from previous QSO and data could be corrupted. BugFix: Minor bug in WAZ management. BugFix: When managing logs in the setup is was not possible to edit the log data as a new log was always created. When starting KLog for the first time, the setup guidance has been improved. When selecting an entity, different from the proposed on country file, KLog asks the user which one to use. Operator from the selected log is used as default when entering QSO (as station callsign). Japanese translation updated. (TNX JL3OXR). Some cleaning in the code. The main improvement of this release is first one in bold. It is a new widget showing the details of the DXCC status where you will be able to see how you are doing per DXCC entity and band. The Satellite data entry widget has been also improved to make it faster easier to add satellite names and modes. I have just uploaded the release candidate (RC1)of 0.9.2.4. As any other Release Candidate (RC), this is a RC version so no final. I am releasing it for you to test, if you want to do some testing and report the bugs. I will not add more functionalities in this version and I will release the final version in a couple of days, if nobody reports a serious bug. Please BACKUP ALL your data before upgrading. Although I have done some tests on my computers, it may happen that this version (as any other) brings a bug… so please test. My recommendation is that you backup the logbook.dat and the klogrc files. Export also your log to an ADIF file before you update any KLog version. I am happy to announce the 0.9.2.3 release. Download KLog from the Download Page. This is not the biggest release of KLog but it brings some new things, like the KLog’s new icon and the Japanese translation! Below, I am showing the changelog for this release. – Improved the way translations are managed (Specially in Linux). – Icon application is now shown in OSX & Windows. – New translation: Japanese by JL3OXR (Thank you!). – Bugfix: Some strings where not defined to be translated (TNX JL3OXR). – Bugfix: Some tips in the UI where not correctly placed (TNX JL3OXR). – Bugfix: QSOs in JT9 were not properly imported from ADIF (TNX EA3XQ). – Bugfix: Logfiles with the in the first line, following some test were not properly imported. Today, KLog is translated into Spanish, English, Catalan and Japanese. If you can help coding, with bug fix, bug reports, translating into another language or writing documentation, please contact me, I will welcome you to the KLog team! Please join the lists, write a review in eHam or simply enjoy KLog, the Linux, OSX & Windows free hamradio logging software! This minor release of KLog is bringing some major-release items althought it was originally though as a minor / bugfix release. One important point of this KLog version is that translations seems to be properly working now and we are bringing one additional language thanks to the great help of EA3NM who translated into Catalan. (Thank you Luis!). – Translations are now working properly in Windows & OSX. – New translation: Catalan by EA3NM (Thank you!). – Ported from Qt4 to Qt5. – BugFix: Aether ADIF files could not be properly imported. (TNX AA5VU). – BugFix: QSOs where not properly shown in the search box. – BugFix: When started for the first time, no modes were shown as default. – BugFix: CTY.CSV was not properly updated. – BugFix: When upgrading the mode information in database some modes where not properly updated. – GUI: Changed the year to show the full number to avoid problems with old QSO. – Import ADIF functionality is improved to support importing of logs with some missing data. – Removed the Spot button until its functionality is implemented. Today, KLog is translated into Spanish, English & Catalan. If you can help me translating into another language, please contact me. 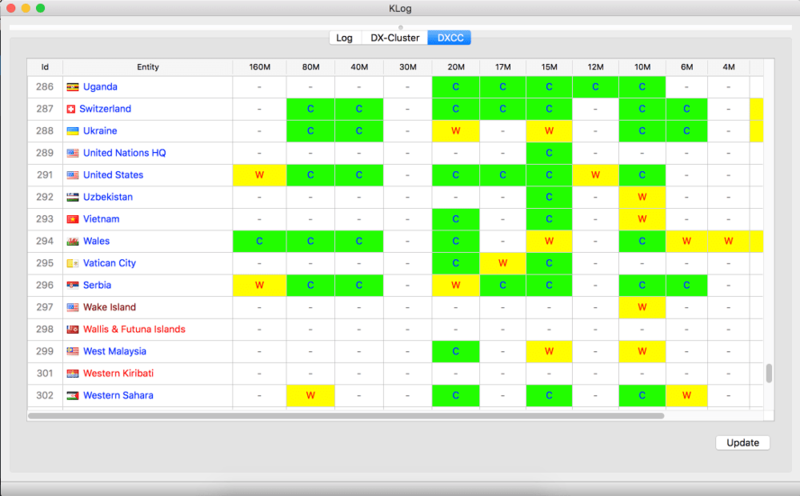 Enjoy KLog, the Linux, OSX & Windows free hamradio logging software. I have decided to implement a test-plan to do some specific tests before deploying any version. I always do some tests before I deploy a new version of KLog but not on a sistematic approach, not always the same tests and it may happen (as this time) that I forget to test important functions of KLog. Because of that, KLog 0.9.2 had an important bug that it is already fixed. KLog was not peoperly saving the band & mode information of new QSOs.